precise reactino, let you feel game ture. ensure the feeling of traditinal round D-pad and accurate positioning, easily control. 4, Crystal Craft Action Buttons: Using twice injection molding process, crystal clear, no printing abrasion. 1) Enable Apple device Bluetooth function, it will search for devices automatically. and "Speedy Gaming Controller "will appear on the Apple device. (Bluetooth LED indicator will become solid after connection is "OK"). 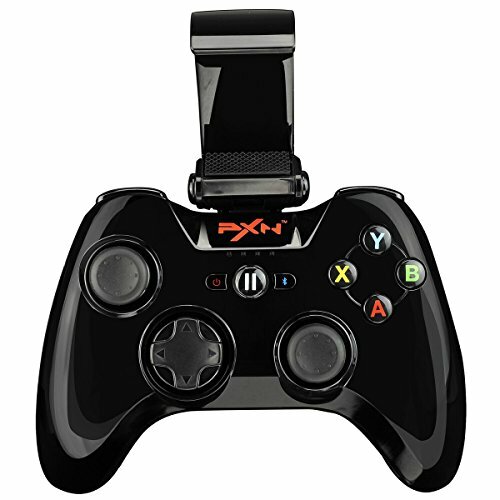 Apple MFi Certified - PXN game controller （Graphite black ）are directly Approved and Certified by Apple. Plug and Play. Bluetooth connection technology, connect the controller and apple device via bluetooth then playing games, do not need to any emulator and jailbreak your apple device. The flight joystick Control game freely. Power saving battery and long working time, with built-in 550mAh lithium gamepad battery,sleep and wake up mode,improve the using time to about 30hours. If you have any questions about this product by PXN, contact us by completing and submitting the form below. If you are looking for a specif part number, please include it with your message.